(3:40 p.m. EDT) -- A major milestone for both Carnival Cruise Line and Orlando's Port Canaveral took place today as ground was officially broken on Terminal 3 -- the single largest project in the port's history and the future home of Carnival's forthcoming Mardi Gras, which will be the largest ship in the fleet. 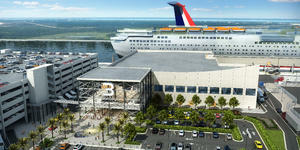 "Port Canaveral gives us such great accessibility with people coming from all over the Southeast, [there is] a great and friendly community here, and that's why we believe this is such a great spot for us to deliver Mardi Gras," Carnival president Christine Duffy said during a ground-breaking ceremony held at the terminal's construction site. Duffy and dignitaries from the port posed with shovels to signal the beginning of construction. The new terminal -- set to open mid-2020, just in time for Mardi Gras' launch -- will feature a contemporary design and technology aimed at speeding up the embarkation process. Terminal 3 will be able to accommodate up to 6,500 passengers, while an adjacent parking facility will hold around 1,800 vehicles. Duffy added that the line sees over 650,000 passengers per year in Port Canaveral, between its three ships currently based there. The line expects that number to grow once Carnival Radiance (now operating as Carnival Victory, which will undergo a $200-million transformation and name change) arrives in 2020, ahead of Mardi Gras. With the launch of Mardi Gras, Port Canaveral will also become the first North American homeport to accommodate a ship powered by Liquefied Natural Gas (LNG), an environmentally friendly fuel that produces nearly zero emissions. A spokesperson for Port Canaveral told Cruise Critic that Mardi Gras will refuel through a process called bunkering, during which a tanker will position itself alongside the ship to supply it with the LNG fuel. Terminal 3 replaces the line's previous facility, for which demolition was completed in July 2018. Materials from the demo have already been recycled and used toward other projects throughout Port Canaveral. In other news, Disney Cruise Line is still in the middle of contract negotiations with firms to renovate its two Port Canaveral-based terminals, Terminal 8 and Terminal 10. Disney aims to complete the renovations by mid-2021, in time for the first of the line's brand-new ships to debut.